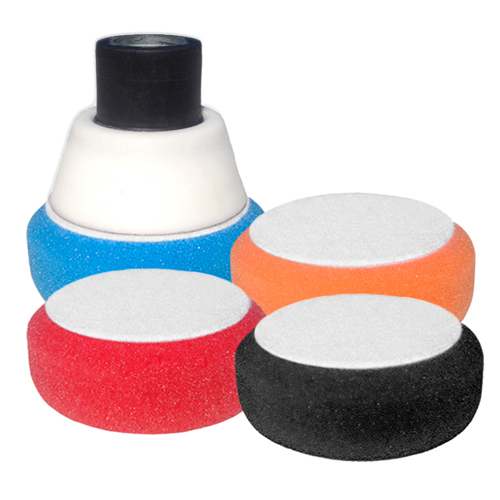 Tapered foam edges for safe and smooth polishing. Engineered for a perfect fit on the LC 2.5" backing plate. Four different premium foams for maximum benefits. Excellent to use with the New Rupes BigFoot Nano iBrid! Lake Country 2" Pads. Lake Country has produced an amazing new small pad line with their 2 inch foam pads. The new 2" pads feature a cut foam edge on the back to prevent the risk of any damage from the backing plate or hook and loop edge. The cut also enables the backing plate to be easily centered for a perfect fit and balances the backing plate and pad in harmony. 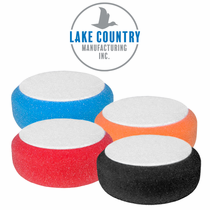 The Lake Country 2" Pads are also slightly cut on the front face to take the edge off of the pad for better control and precision polishing in tight and contoured areas. Pads measure 2" on the back hook and loop, 2 1/4" on the front foam face and 2.5" in the middle part of the pad x 7/8" thick. Blue Hybrid: Cutting. A firm and large celled pad, a defect killer! Orange: Light Cutting/Heavy Polishing. An industry standard for cutting or aggressive polishing. Crimson Hydotech: Polishing. Product stays on the pads surface and won't become over saturated. Black: Finishing. A staple for finishing with perfection. Finishes better than any other black or dark grey pad.